Elec3 Landscape projector light could create a wonderful atmosphere, There is no more need to spend time decorate Christmas trees with cluttered lights. It is a simple, multifunction solution to add atmosphere to Halloween, Christmas, Easter, Valentine's Day, party and room and house, anywhere, anytime. A great way to get in the holiday spirit no matter what the occasion. The slides are very easy to interchange. 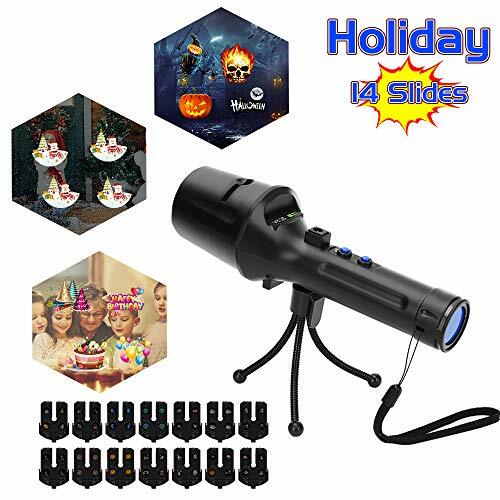 This landscape light has 16 different slides with a good selection of images/themes, including: Christmas trees and Santa, skeleton and pumpkin for Halloween festival, Birthday cake, balloon, and gift box for Birthday, maple leaf, heart-shape, snow flake, pigeon, heels and lipstick, clown, stars. ★RF Remote Control - With our wireless RF controller from up to 50ft away，you can change different modes such as dynamic, fixed, twinkle, and off, Energy efficient to save you money, automatic timer which built in daily 6-hour auto turns off. you can also choose to use the remote control to change 2H, 4H, 6H auto turns off. ★More Brightness And Clarity - interchangeable images Colorful projection images instead of black or white images; Gentle soft led light, better to protect eyes especially for kids and enjoy your day. If you have any questions about this product by Elec3, contact us by completing and submitting the form below. If you are looking for a specif part number, please include it with your message.